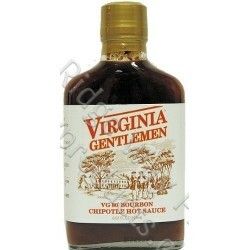 Virginia Gentleman 90 proof small batch bourbon is the key ingredient in Virginia Gentleman hot sauce. Combined with smoked jalapenos (chipotle peppers), the smoky sauce is the perfect combination of heat and flavor. 6.67oz. Approx. Fluid Ounces 6.67 oz.